Although he may publicly reiterate his support for a two-state solution, Netanyahu’s vision for a future Palestinian state is one that would lack nearly all sovereignty. U.S. President Donald Trump said that he favors two states as a solution to the Israeli-Palestinian conflict, during a press conference alongside Israeli Prime Minister Benjamin Netanyahu in New York on Wednesday. One cannot regard Netanyahu’s statements, ostensibly made in good faith, without considering the context in which they were said — that is, in reaction to the president’s statement, which Netanyahu did not wish to contradict. We must, however, remember that only a month ago that same Netanyahu said he sees “no urgency” in promoting any sort of peace deal, and that “peace is made with the strong” – something that clearly does not reflect the Palestinians’ political situation at present. Yet if we are to take Netanyahu seriously, ignoring the ways in which he has made a career out of dismantling the two-state solution, and even if we remember that Trump’s understanding of the peace process includes taking issues such as the status of Jerusalem and Palestinians refugees off the table, we still need to understand what he means when he says that Israel would maintain “security control” of the entire territory west of the Jordan River. It’s an important issue to discuss, not only because Netanyahu has been repeating this phrase for the past several of years, but because we have a great deal of experience to help us learn what Israel defines as “security control” over supposedly autonomous Palestinian territories. Here are just a handful of examples. Complete control over borders. The Gaza precedent shows us just how far Israel is willing to go in using the excuse of “security needs,” while in reality collectively punishing millions of people in the Strip for the decisions and actions of the Hamas government. Control over borders — which will likely be even more entrenched in the West Bank should Netanyahu succeed in keeping the Jordan Valley in Israel’s hands — includes extreme limitations on both import and export of products, thus strangling the Palestinian economy (as noted just this week by the World Bank report). It also entails controlling the movement of people, as well as deciding who gets to work, study, receive medical care, or do something as simple as go on vacation. Together, these policies dictate a great deal of what Palestinian life looks like, making Israel the supreme ruler of the territories — all under the pretext of security. Restricting movement. For almost 30 years, Israel has been adding more and more restrictions on movement between the West Bank and Gaza Strip, for alleged security reasons. Palestinians cannot meet family members, start their own business, or receive medical care on the “other side” of the would-be Palestinian state without Israeli permission. Furthermore, as Israel attempts to bisect the West Bank with settlements, who is to say that Netanyahu’s vision of security control won’t include checkpoints in between Palestinian areas inside the West Bank? Destroying livelihoods. As part of the siege on Gaza, Israel has been destroying crops on the Palestinian side of the fence, limiting access to fishing zones, and even resorting to opening fire on farmers and fishermen, sometimes lethally. In the West Bank, security reasons are used to keep Palestinians away from their own agricultural land, which is often eventually placed under Israeli control. Night raids. According to the Oslo Accords, Israeli soldiers are only allowed in Palestinian cities in cases of a “hot pursuit” of a suspect. In reality, every single night Israeli soldiers awaken Palestinian cities and villages, pulling dozens of Palestinians from their beds and arresting them. Detainees include men and women, young and old – even members of the Palestinian parliament. They are all tried in military courts, and sometimes held without trial in administrative detention. Home demolitions. In recent years Israel has revived and old custom of collective punishment by demolishing the houses of family members of Palestinians who carried out violent attacks against Israelis. In the name of security, innocent people are losing their homes. Slashing funds. Both Israel’s control of borders and the Oslo Accords have created a reality in which Israel collects all sorts of taxes “on behalf” of the Palestinian Authority. Israel will often withhold these funds in order to punish Palestinians for violence or diplomatic moves it deems threatening. Today, Israel is cutting millions from the PA’s in order to stop the money from reaching families of prisoners. Building a new park. A smaller, day-to-day example of how security considerations are used for Israel’s benefit. Israeli authorities are currently at work moving a checkpoint between the village of al-Walajeh and Jerusalem by a few hundred meters. The official reason is security. The real reason, however, is that the village includes a beautiful spring, which the villagers often visit for leisure. The Jerusalem municipality recently announced a plan to designate the area as a new park for Israelis, meaning that the new location of the checkpoint will help ensure that Palestinians can only look their spring from afar. These are only a handful of examples. If Netanyahu does move forward on his stated agenda, we would do well to remember exactly what “security control” means for Palestinians, and why they would likely vehemently oppose such an idea. This is not to say that Israeli citizens don’t deserve to enjoy security. There is no question that any end to the occupation must promise peace, security, equality, and freedom to all those who live on this land. But security arrangements can be agreed upon between two sovereign states, ensuring that both their peoples’ interests are considered – rather than the interests of one people. In the process, negotiators would have to make sure that “security” is not used as a cover for a more sinister agenda. A solution based on two states is, of course, not the only option. Israelis and Palestinians can live under a single state in which no group of people is more entitled to security and equality. Either of these solutions is legitimate, as long as we put an end to the illegitimate military rule over millions of Palestinians who are denied the most basic of human and civil rights. Fakestine does not deserve self-determination for the same reasons that Narnia and Middle Earth dom’t deserve it. Their all fictions conjured up by JRR Tolkien, CS Lewis and Y. Arafat, respectively. Far less fictitious, don’t you think, than the preposterous idea that the Book of Joshua entitles you to (1) a swimming pool in Ariel, and (2) to steal land, establish an apartheid regime, engineer forced population transfer and commit mass murder? Wrong as usual. the Book of Joshua does not entitle anything. Israel’s existence and it’s ability to defend itself does. And your usual nonsense about Apartheid which I refuted in detail and again with the ‘mass murder’ hyperbole. If you want to see actual mass murder of Palestinians, look at what the Syrians are doing to them, especially in Yarmouk. The estimated Palestinians dead since the beginning of the civil war is more than 4,000 with thousands others still unconfirmed but probably dead as well. Oh. Ok. That’s not what Lewis says. But ok, then you say that Israel’s ability to defend itself entitles you to (1) a swimming pool in Ariel, and (2) to steal land, establish an apartheid regime, engineer forced population transfer and commit mass murder? We respectfully disagree with that too. Sounds equally fictitious. Nope, I was talking about Israel’s self determination and existence, I believe I was very clear. And I was responding to you hyperbolic nonsense about Apartheid and ‘mass murder’, I believe that was also very clear. I did not answer ‘Lewis from Afula’, I was responding to your nonsense, not his. You again repeat the stupid nonsense about Apartheid, mass murder and population transfer, ignoring reality as usual. @Ido talking about “stealing land” and “appartheid regim” is not a nonsens. The transfer of landorship (only 7% belong to jewish people before 1948) was done by force against the palestinian population willingness without any compensation: so we can consider it as a land stolen. Regarding the appartheid, I know you don’t like this comparison, but if Mandela did it, you should consider, than maybe, you don’t have the monopole of the truth and the comparison is not so far from the reality. With the failure of the Oslo agreement and the end of the 2 states solution, the occupation is turning into a permanent “de facto” appartheid. “we can consider it as a land stolen” – sure if you ignore the historical and legal context of Israel’s presence there. The West Bank is disputed territory whose status can only be determined through negotiations, the West Bank was not under the legitimate and recognized sovereignty of any state prior to the Six Day War. Israel’s presence in the West Bank began in 1967 as a direct result of the aggressive actions of Israel’s neighbors that forced Israel into a war of self-defense. UN Security Council Resolution 242 places obligations on both sides (as does Resolution 338, adopted following the 1973 Yom Kippur War). 242 does not call for unilateral withdrawal from the territories. Despite this, the Palestinians focus exclusively on the call for an Israeli withdrawal, ignoring those clauses that place responsibilities on the other parties to the conflict. Resolution 242 does not require Israel to withdraw from all the territories gained as a result of the 1967 war, as the Arab regimes claim. Instead, the resolution deliberately restricts itself to calling for Israel’s withdrawal “from territories” while recognizing the right to live within secure and recognized boundaries. Israel’s presence in the territories continued after 1967 as the Arab regimes refused to negotiate with Israel (Khartoum Resolution) despite continuous and genuine Israeli offers of peace. For close to a quarter century, the Palestinians refused to abandon terrorism and calls for Israel’s demise and conduct peaceful negotiations. Many states hold onto territory taken in a war, particularly a war of self-defense until a peace treaty is negotiated. Also the people of Israel have a continuous centuries-old presence there. And the need to secure its strategic and economic center which the West Bank has a direct aim at. That being said, I am in favor of almost full withdrawal from the West Bank pending a genuine peace agreement (while keeping areas essential to Israel’s security). I’ve been there and I’ve seen what is going on there, Israel has no place being there. @Ido, “Resolution 242 does not require Israel to withdraw from all the territories gained as a result of the 1967 war” In the french version (that is also an official langage of the UN, at the same level as the english) there is no ambiguity ! There is no ambiguity also than civil population transfer in occupied territories is a crime. You always bring the exemple of Benjamin Pogrund, a jewish white South african. I don’t know if he knows better the appartheid than Mandela. Maybe you can just consider than there are some similarities. In particular, occupation means temporary, so after 50years and no hope for an independant palestinian state, it’s revealing to call it “de facto” appartheid. “there is no ambiguity” – right, there is none, it says what I aid it does. There is also no ambiguity about the population transfer of Jews from Arab/Islamic countries at the same time period. There were a lot more of them but they were not used as perpetual “refugees” for strategic and political reasons. “So occupation for security only” – um, what ? are you referring to the security measures ? then yes. The settlements ? then no. “I don’t know if he knows better the appartheid than Mandela” – No matter how much you and other ‘Clueless Idiots’ want this so bad, Israel is not Apartheid. Not similar in context, reason or reality as the link shows quite clearly. “some similarities” – yes there is separation. There are humans involved. But it’s not similar to SA Apartheid on multiple levels. In fact how the Palestinians treat their own population in the refugee camps is more similar to actual Apartheid. If you want it hard enough, as it is in this case, you can find similarities between many things who are different in context and reason. “so after 50years” – you’re right. Maybe it’s time for the Palestinians to come to terms that Israel is not going away and it’s time to accept the reality of Israel’s existence, the homeland of the Jewish people, and stop the Palestinian leadership rejectionism of any and all peace offers and the calls for Israel’s elimination. @Ido, You should look outside your israeli propaganda, diversify your source of information (standwithus ? lol) and stop rewrite history. At the end, when so many human activist, including Mandela (that know appartheid better than all of us) are doing the comparison, maybe there are some similarities. By the way, you still avoid to answer to the fundamental question regarding the purpose of the civil occupation ? Why to install 600 000 settlers in the middle of west bank that prevent any chance to have a continuous independant palestinian state with east jerusalem as a capital ? “diversify your source of information (standwithus ? lol)” – which fact is wrong ? which quote is inaccurate ? please do go right ahead. “it’s mean all the territories” – so the English translation everywhere is wrong ? is the other parts I mentioned which you ignored: obligations on both sides, the responsibilities on the other parties to the conflict, the right to live within secure and recognized boundaries, everything else in my post which you ignored are English only additions ? “maybe there are some similarities” – addressed this in the previous post. Again not going to repeat myself. It’s not Apartheid, not by context, reason or reality. Yes there are similarities. There are similarities between a chicken and a horse as well. Go try riding a chicken. “avoid to answer to the fundamental question regarding the purpose of the civil occupation ? ” – why are you lying ? I didn’t avoid anything, I tried to understand what you meant (“um, what ?” is a clue), and asked you if you are you referring to the security measures or the settlements. The post is right there. “install 600 000 settlers in the middle of west bank” – because the government who did this thought it was a good idea ? Jordan officially forfeited the land ? because it was mostly abandoned ? probably a combination of all 3. “to have a continuous independant palestinian state” – there was no “Palestinian state”, there was no talk about it when the West Bank was under Jordan’s control. You didn’t know this ? The PLO’s goal was to eliminate Israel before 67′, to them all Israel is “Palestine”, sounds familiar ? because it’s still the exact goal of the Palestinian leadership, both Fatah and Hamas. – “diversify your source of information (standwithus ? lol)” It’s interesting, you’re answering with an other propaganda israeli website. Quotation out of context don’t have a lot of interest (same ways as all racist quotations from sionist leader). You should prefer historian works (israeli palestinian or whatever) that has recognised the very small real impact of the “arab leaders call for leaving ” to explain the deportation of 700/800 000 people. Regarding “the Apartheid”, Just accept that you don”t have the monopole of the truth, if the greatest human activits are doing the comparison, maybe it’s time to open your eyes on the reality. I still don’t undestand at all your logic and your justification regarding the civil occupation and the settlement of 600 000 settlers in the future state of Palestine. Of course, the palestian state did not exist because there was a Jordanian occupation before, Of course in 1969 the Fatah has not recognised the state of Israel yet. AND ???? what is the link ? Why to settle 600 000 setllers in the middle of the future state of Palestine? How this civil occupation can help the two-state solution ? (part 1): “you’re answering with an other propaganda israeli website” – so you completely ignored how every fact on that article is numbered and annotated in the bottom where the source for the information is given ? I ask again: which fact is incorrect ? which claim is wrong ? something out of context ? go right ahead. That site explains in detail the lying myth and “historic revisionism” of the Palestinian narrative in detail, so you’re saying you are not familiar with this ? interesting. Are you also not familiar with top Palestinian leaders, including the anti-semite Holocaust denier President himself, Mahmoud Abbas, claiming nonsense like the Palestinian nation is actually the 6,000 year old Canaanites ? his denial of the Jews historic connection to Israel ? how the Palestinians existed before Abraham ? all of this is news to you ? “Quotation out of context don’t have a lot of interest” – you didn’t answer my question. Why is that ? I ask again: which fact is wrong ? which quote is inaccurate ? out of context ? please do go right ahead. “has recognised the very small real impact of the “arab leaders call for leaving ”” – I never said they were the only reason but the evidence, which you are yet to refute, speaks quite loudly for itself. “The english translation is ambigus” – right, ambiguous. But the rest of the parts you just ignored which I mentioned are not, right ? “I just don’t look only on the responsability of one side as you are continuously doing” – Right, the war to destroy Israel and the Arab attempt to genocide the Jews was also the Jews’ fault. And why are you lying ? I simply point to facts you don’t seem to be aware of. “everytime someone dare to criticise Israel” – why are you lying about this ? I have no problem with criticism of Israel, I had my fair share for Netanyahu and the Israeli government and settlers. What I say I back with proof. I state facts which you can easily either refute or verify yourself. I have a problem with lies and Palestinian propaganda nonsense taken as fact, with “historic revisionism” and ‘Useful Idiots’ who don’t seem to have a clue about basic facts. “Israel do not respect the international laws and the several UN resolutions along the history.” – Answered this in detail 6 posts above, not going to repeat myself. Feel free to address said post. (part 2): “UN resolutions” – right, many basically criticizing Israel’s audacity for defending itself and refusing to turn over and die. The UN has always been a joke in that regard. There are more resolutions condemning Israel than on the rest of the world combined. This is a farce. “accept that you don”t have the monopole of the truth” – I accept how you again ignore how Israel is not similar to Apartheid, not by context, reasons or reality. As I explained. “if the greatest human activits are doing the comparison” – Clearly these people are above human and are all knowing. There are quite a few activists who are more aware of reality. “maybe it’s time to open your eyes on the reality.” – maybe it’s time for you to grasp the fact that no matter how much pro-Palestinian and delusional ‘Useful Idiots’ want it to be, Israel is not Apartheid. In fact the discriminatory two-tiered segregation system maintained by the Palestinian leadership throughout Areas A and B in the West Bank are closer to actual Apartheid. “I still don’t undestand” – so I’ll repeat: because the government who did this thought it was a good idea ? Jordan officially forfeited the land ? because it was mostly abandoned ? probably a combination of all 3. I’ll add that there have been Jews living there throughout history as well. “in the future state of Palestine” – Again: didn’t exist back then. The Palestinian leadership saw Israel itself, not the West Bank, as their “Palestine”. As I already said which you ignored. “in 1969 the Fatah has not recognised the state of Israel yet” – to this day they don’t accept the legitimacy of Israel and see all of Israel, from the sea to the river, as theirs. Their charter calling for Israel’s demise is still there. (part 3): “AND ???? what is the link ?” – sure: the 1949 Armistice Agreements were never intended to be Israel’s final borders, the armistice agreement with Jordan clearly stated: “no provision of this Agreement shall in any way prejudice the rights, claims and positions of either Party hereto in the ultimate peaceful settlement of the Palestine question, the provisions of this Agreement being dictated exclusively by military considerations”. The West Bank was captured from Jordan. At first the settlements were established by Israeli citizens with government approval. Many of these settlements were established on land you couldn’t exactly call “Palestinian”. The Palestinians never held sovereignty over the West Bank and rejected all promises of sovereignty over those areas. and some of the areas on which settlements were established, like Gush Etzion and Hevron, had Jewish communities that had existed sometimes for thousands of years before they were depopulated in Arab riots and by Arab armies in Israel’s war for independence. It is commonly claimed that the establishment of Israeli settlements constitutes a land grab, however this claim does not stand up to basic historic scrutiny (see the post above about “stolen land”). The settlement blocs Israel wishes to keep in an agreement with “Palestine” comprise only a few percent of the West Bank, and Israel is willing to transfer an equal amount of land in exchange for those settlements. @Ido : It’s really usless to debate with you. Your speach is full of hantred, propaganda, you can’t see outside your box and always answering the same stupidities (you can say it one hundred time, it will not make it happen), without any logic. I give up sorry, don’t want to waste my time anymore. Have a good day. That’s hilarious, said the guy who refuses to accept evidence not to his liking, backed by cited sources and still refuses to specify which of the quotes I provided is wrong or out of context. You didn’t answer my questions of course, about the lies at the core of the Palestinian narrative but that’s not a surprise. “can’t see outside your box” – I ask again: by all means, which evidence I provided is wrong ? inaccurate ? out of context ? why is this so difficult for you ? You label my links as propaganda but refuse to specify what is wrong with the actual evidence. Repeatedly. When you said something which is wrong I explained why that is, backed by proof. So please go right ahead. “you can say it one hundred time” – you ask the same questions over and over again when I answered them already multiple times. “don’t want to waste my time anymore” – You seem to not be aware of some of the fundamentals of the Israeli-Palestinian conflict and the Palestinian narrative, goals and actions. And basic Middle-Eastern history. I answered your questions. In detail. Each and every one. If dealing with reality is too harsh for you, you have my sympathy. At least I hope you learned something. @Ido, You re ridicilous, you don”t answer to my questions either, just spreading your hatred all along your speach, and repeating the same stupid arguments. “you don”t answer to my questions either” – why are you lying when the posts are right there ? when the evidence you refuse to touch is right there ? “just spreading your hatred” – I ask again: which fact is wrong ? which evidence is wrong ? which quote is wrong ? out of context ? why is this so difficult for you that you again ignore this ? “and repeating the same stupid arguments” – then refute them. Addressed them. Address the evidence, answer my questions. Go right ahead. Why is this so difficult for you ? @Ido, I’ve sent already dozen of messages (+additional +20 in an other discussion on an other page), with a lot of arguments, facts, answers, and question raised. You maybe not agree but stop being arrogant, pretending that you’re the only one who know the truth. It’s impossible to debate with a wall. “Ido, I’ve sent already dozen of messages” – and I have the same amount refuting your posts, in great detail. “with a lot of arguments” – yes, which I refuted, all posted right there above. “facts, answers, and question raised” – I have addressed every single thing you said, wish I can say the same about you. “stop being arrogant” – interesting “rephrasing” of me addressing and refuting your posts. “the only one who know the truth” – don’t be ridiculous. “It’s impossible to debate with a wall” – then address my posts, answer my questions. for the record this does not mean asking me to name a non-existent city or town. Start with your “creative” idea that all of “Palestine” was apparently an Arab town. @Ben: “Ido, with his signature..line of bullsh*t” – that’s hysterical, are you lying to yourself about this as well ? so the posts above refuting his posts do not exist ? I’m looking at them right now. Interesting. Is this part of your selective processing of reality shtick ? like when I prove you have no clue what you’re talking about ? when you lie and say clueless hilarious nonsense ? when you ignore evidence which contradicts your clueless nonsense repeatedly ? “he comes to the same ugly impasse with everyone” – gee, on a pro-Palestinian news blog, what are the odds of meeting pro-Palestinian useful-idiots who are clueless about basic history and what the Palestinians say or do. Thanks for the laugh, as usual. “I would bet good money on that proposition” – I would bet good money on you ignoring posts and evidence refuting your lying clueless nonsense again. I must say, your “it’s not about the charter!” bit is your masterpiece. Now that is clueless par excellence. Good job sir! Your main tactic has always been to try to exhaust people with endless slippery BS, tediously perseverated, in feats of dense verbosity, linking to contentious sites that spin involved distortions, rabbit holes of contentious misleading and usually quite hackneyed propaganda that distracts and gets us away from the +972 article’s glaring main point. We see this same tactic playing out here with the “why haven’t you addressed my endless slippery BS in detail where I proved nothing for the umpteenth time?” tactic for the umpteenth time. When people with limited time and patience zero in on one aspect, and nail it, then you slip slide away with “why are you changing the subject and you haven’t addressed the twenty other slippery distorting items I demand you disprove, proof that you are a clueless liar who has no idea what he is talking about.” A co-tactic, when someone nails you, is to respond with “why are you lying about me?, that’s not exactly, literally, word for word what I said, I said something trivially different than that and so you are a clueless lying liar who has no idea what he is talking about.” I am really not caricaturing you so much as exposing you, stripping away the pretense. This is what you do. It is as predictable as it is inane. (part 1): “Your main tactic has always been to try to exhaust people” – right, all the posts refuting your nonsense and the evidence you refuse to touch does not exist. Why are you sill ignoring this ? why are you making a fool of yourself ? “linking to contentious sites that spin involved distortions” – then address them, refute them, go ahead. I addressed everything you said, pointed in detail how what you said is simply factually incorrect, you simply ignore this as if it never happens, like a child you can’t handle reality. Evidence which also consisted of the top leadership of the Palestinians including their very own anti-semite Holocaust denier President, yelling the truth in your clueless face. Why are you ignoring this ? you made some very amusing lying excuses not to, remember ? why are you ignoring the posts above explaining how you were wrong about the Palestinians acceptance of Israel’s legitimacy ? your “it’s not about the charter” embarrassing hilarity ? “hackneyed propaganda that distracts” – then address them like I refute your clueless nonsense. Saying “it’s propaganda!” without backing up your claim is childishly idiotic. This is especially hilarious since you have been literally trying to distract and change the subject repeatedly as I point out. “+972 article’s glaring main point” – oh I wasn’t talking about this pro-Palestinian leftist “main points” which sometimes, as I pointed out in detail several times, border on alternate reality science fiction. I was talking about your clueless ‘Useful Idiot’ nonsense, specifically. “We see this same tactic playing out here with the “why haven’t you addressed my endless slippery BS” – right, it’s preposterous to ask you to address the posts where I point out in detail how you’re a clueless liar who has no idea what he’s talking about. preposterous! “I proved nothing for the umpteenth time” – why are you lying when the posts are right there ? do you honestly think this benefits you in any way ? are you really this stupid ? “why are you changing the subject” – because this is one of your more favorite recent tactic, you can’t handle what I’m posting, refuting your nonsense, so you change the subject. Are you lying about this as well ? amazing. “twenty other slippery distorting items I demand you disprove” – how does pointing in detail how you’re a clueless liar backed by evidence is “slippery distorting items” ? please, by all means, show me where. Point it out. Why is this so difficult for you ? (part 2): “A co-tactic, when someone nails you” – hilarious.. when someone nails me.. why are you lying like this ? this is a new low on your ‘projection’ tactic, to avoid addressing my posts. And I thought you can’t be more pathetic. “that’s not exactly, literally, word for word what I said” – come on now, I point in detail exactly when you lie, when you claim I said things I never did, when you state “facts” you are aware are wrong, etc. I’ll put some of your more classic links of comments section with a list of your lies in the Facebook comments section. please point where I distorted what you said, which is actually something you did the other day about what I was saying. ‘Projecting’ again, figures. “something trivially different” – um, I caught you lying, especially about me, so many times and I pointed it out so many times. This is not “rephrasing”, “artistic license”, “inverting” or any of your more colorful excuses when I catch you spewing your clueless nonsense. “This is what you do” – what I do is point out in great detail how you’re a clueless liar who doesn’t know what he’s talking about, see the posts above for some examples. Posts you are yet to even address here. “It is as predictable” – not as predictable as you elegantly ignoring my posts and evidence, proving in detail how you’re clueless. @Ido, I’ve refuting your hundred posts and you ve answered my hundreds post. So again, you don’t have the monopole of the truth. @Tom: “you ve answered my hundreds post” – why are you lying when the posts are right there ? I assume you meant to say ‘never’. This is especially amusing since you again ignored the last question from my post post, which I gave as an example. “you don’t have the monopole of the truth” – that’s an interesting take. There is one truth that is factually correct and can be backed by evidence. You, for example, claiming there was no uninhabited land in “Palestine” is a good example of something which is factually incorrect. Thanks for the exhausting tedious dense verbose reply. You really gotta give up the “why are you lying when the posts are right there?” schtick. It is especially obnoxious. And that’s against a baseline that is hard to top. Thank you for again ignoring my posts, proving my point. “really gotta give up the “why are you lying when the posts are right there” – so pointing out the posts refuting your lying nonsense are posted above is uncomfortable for you and your denial of reality ? you’ll get over it. “It is especially obnoxious” – sorry if I hurt your feelings. still, reality isn’t going to change because you dislike addressing it. “that is hard to top” – not as hard as your efforts to ignore the posts showing in detail how you’re a clueless liar who has no idea what he’s talking about. Like I said (which you of course ignored), added many examples in the Facebook comments section. Enjoy. We’ll all be sure to scrutinize then in depth, pore over every detail, mull their profound meaning, engage in talmudic discussions on their significance, contain our intense pleasure at their surpassing intellectual reward, and get back to you. Thank you for proving my point once again by ignoring my posts which show in detail how you’re a clueless liar who has no idea what he’s talking about. This new pathetic excuse “strategy” not to do so is not among your best but it shows some effort so you have this going for you. Which is nice. Oh yes it’s SO important. Your brilliant analyses with links have made the scales fall from our eyes. We are joining Likud or maybe Habayit Hayehudi today. Thank you for again proving my point by ignoring my posts which show in detail how you’re a clueless liar who has no idea what he’s talking about. And we have another squirmy pathetic excuse of a “strategy” not to do so. Now it’s about importance for some reason. You’re right, fact based reality is not that important. As long as ‘Useful Idiots’ like you can cling to their delusional nonsense even when the evidence contradicting them is shoved in their face repeatedly, it’s all good. This responses are as far from perfect as anyone with basic knowledge of Middle-East history can see. 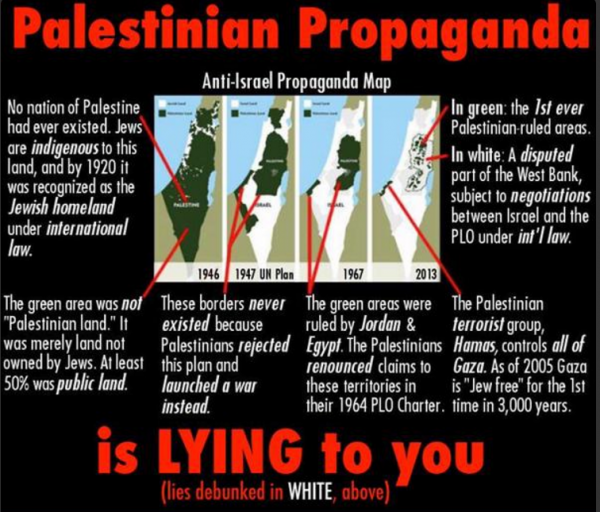 First the map of “palestine”, that’s a historic fabrication, based on a lie claiming the green area was a country/nation called “Palestine”. That is simply historically incorrect. The coin, the stamps etc: These are Palestinian British coins, the coin was not minted by Arabs and what is written on the coin in Hebrew proves just how far Palestine was from being an Arab country. Same for the stamp, it’s British. “Palestine” was the name of the region where multiple people lived including Jews and British, it was a name of a geographic region, not a nation or historic country like the Palestinian narrative lies about. “The Palestinian people do not exist. The creation of a Palestinian state is only a means for continuing our struggle against the state of Israel for our Arab unity. In reality today there is no difference between Jordanians, Palestinians, Syrians and Lebanese. Only for political and tactical reasons do we speak today about the existence of a Palestinian people, since Arab national interests demand that we posit the existence of a distinct ‘Palestinian people’ to oppose Zionism for tactical reasons, Jordan, which is a sovereign state with defined borders, cannot raise claims to Haifa and Jaffa. While as a Palestinian, I can undoubtedly demand Haifa, Jaffa, Beer-Sheva and Jerusalem”. “The fact that there was never a COUNTRY called ‘Palestine’ is irrelevant” – then you are unfamiliar with the Palestinian narrative which is literally based on it. “At one point there had never been a country called ‘America’, so what?” – Like I said, you don’t seem to be familiar with what the Palestinians claim because they insist such a nation/country actually existed and it’s integral to their narrative and claims, using some of the more elaborated lies I have ever seen. “Palestine” was the name of a geographic region where Jews also lived in, also a century ago the word “Palestinians” was most commonly used to describe the Jewish residents of the area, not the Arabs who today call themselves Palestinians. “We have millions of stateless people with no rights” – you have millions of perpetual refugees by design, 3th and 4th generation, who are prohibited by their Arab brethren to become citizen where they were born because they make a great political weapon against Israel, you have Palestinian “refugees” in Gaza and the Palestinian Authority because the Palestinians themselves keep them as refugees even though they are literally in “Palestine”. And their rights problem have a lot do do with the current leadership they chose, the Islamic terrorist theocracy in Gaza and the Kleptocracy corrupt dictatorship ruling in the West Bank. “One state, two states or apartheid?” -two states of course, preferably with cooperation with Jordan, as the West Bank Palestinians were Jordanians, and Egypt, since the Palestinians in Gaza were under Egypt’s rule before 1967. You for some reason neglected to address the part where “the perfect responses” you mentioned are lies and “historical revisionism”. None of this by Geller, including what Geller says some Palestinians somewhere claim, negates Bruce Gould’s point: “The fact that there was never a COUNTRY called ‘Palestine’ is irrelevant, it’s silly, it’s ridiculous.” Put a fork in it. Sure. First they need to sing Hatikhvah and formally endorse a Nation-State-Law-backed “Jewish State,” then they need give up most or all of Area C including Ariel and E1 naturally, then become Jordanian-Egyptians, and what’s next, join the Martian Inter-Galactic Space Federation? Now we see again what “I am against the occupation” really means. “Put a fork in it” – so you too have no clue about what the Palestinians claim and how it’s integral to the lies in the center of the Palestinian narrative ? What a shock. “First they need to sing Hatikhvah and formally endorse a Nation-State-Law-backed” – Never said any of this of course. “Jewish State” – Israel is the Jewish state, the historic homeland of the Jewish people. If you have a problem with this then you have a problem with basic history. “most or all of Area C” – why are you making stuff up ? so area C is 5% of the West Bank ? at least in 2 different peace offers Israel made it was around 95% of the West Bank. Care to explain you math ? “become Jordanian-Egyptians” – I never said this of course, this is you again making stuff up. I’m guessing you didn’t know the Arabs in the West Bank who call themselves Palestinians now were part of Jordan before 67. Or the Arabs in Gaza who now call themselves Palestinians were part of Egypt. So you had no clue Jordan is in effect a Palestinian country as well ? the Palestinians even use their exact flag, minus the royal symbol. “join the Martian Inter-Galactic Space Federation?” – well, based on your other hyperbolic nonsense I wouldn’t put it passed you to mention something like this. “Now we see again what “I am against the occupation” really means.” – right. Giving the Palestinians almost all the West Bank means I support the occupation. Makes sense. I’m sorry, I somehow missed this gem: “some Palestinians somewhere claim”. Seriously ? ‘some Palestinians somewhere’ ? so you are really this unfamiliar with the Palestinian narrative ? they claim the ancestors of today’s Palestinians were there before the Israelites, how Palestinians have lived there as a nation continuously and their nationality is different from other Levant Arab peoples. The truth is of course quite different: the Arabs of Palestine were not a national group and never have been. They were largely undifferentiated from the Arabs of Syria, Lebanon and Jordan. They had no authentic tie to the Land of Israel. Many only came for economic opportunity after the Zionist movement began when the local economy took off. In all the years of Arab and Muslim control from the 7th century, Palestine was never a separate state and Jerusalem was never a capital. I can go on if you like. By the way, another point of the Palestinian narrative is how Judaism is only a religion of revelation, like Christianity, and has no inherent ties to Israel. Jews are not a nation but rather a community of believers. Do you believe they actually try to spin this total lying nonsense and there are idiots out there who actually are this clueless about history and they actually believe this ? I guess you didn’t know that all of the slanted narrative you offer about others narratives and about the narrative of “the Jews” whose self-appointed spokesman you are suffers from half truths and distortions and simplifications too. As well as the irrelevancies Bruce points out. And I guess you didn’t know that your narrative of “the Arabs of Palestine” whose self-appointed spokesman you are suffers from half truths and distortions and simplifications too. As well as the irrelevancies Bruce points out. And I guess you didn’t know that “the Jews are a nation” is obviously itself a kind of awkward simplification driven by your political imperatives, not definitive scientific all-encompassing historical truth and a summation of where we stand today or some kind of real estate deed with God as your real estate agent. And I guess you didn’t know that by the same token the Palestinians have every right to their own “nation” narrative even if some of them get carried away with assertions of historical truth and historical imperative as you do. And I guess you didn’t know that both Israelis and Palestinians have their own right of return narratives and the substantial difference is the historical time frames in which those return narratives play out, but they are each of them narratives which can be respected. And I guess you didn’t know that all of this you are peddling is narrative logic not scientific causal logic, with all the methodological strengths and weaknesses that entails. (You won’t understand any of this but I don’t feel it is my duty to convince you. I only need to explain things truthfully, no matter who this scandalizes and who is muttering in the background “I guess you didn’t know”.) And I guess you didn’t know that I already told you that none of this by you, including what you say and what some Palestinians somewhere say, negates Bruce Gould’s point: “The fact that there was never a COUNTRY called ‘Palestine’ is irrelevant, it’s silly, it’s ridiculous. As far as your “‘giving’ the Palestinians almost all the West Bank,” this is like a used car salesman telling me he is “giving” me almost all of the car except a few unimportant details like the carburetor and the tires and the transmission and the radiator but “its a swell car you lucky guy I am so generous! Oh, and the price is a bit more than you reckoned for but this is your lucky day! What? Are you trying to steal the car or blow up my dealership? Huh?” You and Bibi are used car salesmen par excellence. It is not for nothing that “used car salesman” is a term applied to Bibi exceptionally often. We’re not buying. (part 1): “all of the slanted narrative” – slanted ? you seriously didn’t know about this ? or are you playing dumb ? “narrative of “the Jews” whose self-appointed spokesman you are” – what the.. ? are you saying basic history, literally historic fact of the existence of one of the oldest nations in history is my “self-appointed narrative” ? are you insane ? “suffers from half truths and distortions and simplifications too” – please by all means, go right ahead. What is half truths ? distortions ? simplifications ? I really would like to see this one. This is great. “As well as the irrelevancies Bruce points out” – Right, the most integral point which the Palestinians base their entire narrative on is irrelevant. This is some good stuff for future reference. “the Arabs of Palestine whose self-appointed spokesman you are” – Again: basic Middle-Eastern history. Why are you saying such incredible nonsense ? I’m not history’s spokesman. It quite clearly speak for itself to anyone who is familiar with the actual historic facts. ““the Jews are a nation is obviously itself a kind of awkward simplification driven by your political” – holy s@*t, one of the oldest nations on earth with shared ancestry, history, culture, tradition, language and even a distinct religion, spanning a couple of millennia is ‘obviously a kind of awkward simplification’. This is amazing, it really is. Just for the fun of it I’ll post the historic evidence you for some reason choose to ignore or simply not aware of in the Facebook comments section. You just said one of the stupidest thing I have ever heard. Ever. “not definitive scientific all-encompassing historical truth” – um, it’s literally scientific historic proof. One you can literally bang the evidence on your head. How can you say something this insanely stupid and expect anyone to take you seriously ? “real estate deed with God” – Again: actual historic evidence, literally. Not a deed with any deity. Actual evidence, see the links in the Facebook comments section. This is amazing. You really believe this incredible nonsense. “Palestinians have every right to their own nation” – sure they have, but their narrative is based on a lie. A fabrication of history. You seem to be one of the ‘Useful Idiots’ who take their lies for granted and choose to ignore actual history. This is great. “carried away with assertions of historical truth” – hilarious.. blatant lies and fabrication of history is just someone ‘getting carried away with the truth’. You can’t make this hilarious nonsense up. Well, you sure can. For example apparently the Palestinian President himself is just ‘some of them’. But he’s “not important and not influential”, right ? some idiot actually said this about the Palestinian leader of the PLO. (part 2): “the historical time frames” – nope, they are vastly different with different causes, reasons, background history and implications in today’s reality. “you are peddling is narrative logic not scientific causal logic” – um, it’s basic Middle-Eastern history. Historic fact is not ‘narrative logic’. This is you saying incredible nonsense. “I don’t feel it is my duty to convince you” – Right. Claim some hilarious unsubstantial lying nonsense, make hilarious excuses for your blatant “historical revisionism” but there’s no need to actually back it up. No sir. This is great. “I only need to explain things truthfully” – you need to back up your hilarious nonsense. Please go ahead. I’m eager to see this, should be good. I provided proof in the Facebook comments section, please go right ahead. “some Palestinians somewhere say” – Again with the ‘some Palestinians say’. Are you this unaware of the basis of the Palestinian narrative ? go tell any Palestinian that his nationality is a recent invention and that a Palestinian country or nation never existed in human history. How many Palestinians do you think will smile and agree with you ? “The fact that there was never a COUNTRY called ‘Palestine’ is irrelevant” – how can it be irrelevant when the entire Palestinian narrative, their demands and reasoning, is based on it ? do explain. “silly, it’s ridiculous” – what’s silly and ridiculous is the amount of nonsense and ignorance you just spewed. I’m literally in awe. “a used car salesman telling me he is giving me almost all of the car except a few unimportant details” – Please explain how 95% of the West Bank, the rest traded in land swap, is anything like your hilariously wrong analogy. “You and Bibi are used car salesmen” – you are a clueless ‘Useful Idiot’ who believes some of the more insane anti-Israel propaganda and you seem to make some of the most hilarious excuses to justify your ignorance and insane claims. “We’re not buying” – That’s an interesting take on your tactic of rejecting reality and substituting it with your own hilarious clueless nonsense. As I think I told you, I anticipated you would not understand any of this and honestly it is not my duty or my purpose to convince you. About that used car…one shouldn’t recognize your ownership of the car in the first place. Nor have you defined the boundaries of your “dealership” or why you think you get to “deal” the car to somebody else on your terms in violation of every law governing this situation. “I anticipated you would not understand any of this” – oh I understood it allright. As I explained in detail in the 2 posts above you just ignored, along with the evidence I provided which you just ignored. Not only are you a firm believer in some of the most blatant lying anti-Israel propaganda in existence, you also think you don’t need to back up your ridiculous nonsense because and I quote “you speak truthfully”. I can’t make this stuff up, you actually said this. “not my duty or my purpose to convince” – of course it is if you don’t want to look like a joke which you most certainly are as proven in the posts above. And for the record: you ignoring my posts and evidence because apparently reality is uncomfortable to you does not constitute as ‘proof’. I asked: “Please explain how 95% of the West Bank, the rest traded in land swap, is anything like your hilariously wrong analogy”. And since you came to the inevitable conclusion that your analogy was idiotically wrong, you now try something else, about ownership. This sort of pathetic squirming and dodging is very amusing. So let’s go back to what you actually said before you realized it was idiotic: explain how 95% of the West Bank, the rest traded in land swap, is anything like your hilariously wrong analogy. And of course you continue with your pathetic dodging with “Nor have you defined the boundaries of your “dealership”” which is of course incorrect if you are familiar with the peace negotiations and their details, naming the actual settlement blocks that were not up for debate, about 5% of the West Bank. “But for the deeper meaning of the restrictions on Area A” – and you change the subject to a debate from a different article, anything not to touch your ridiculous ignorant nonsense I detailed in the posts above. I gave you an answer about this topic as well on the relevant article. “ought to educated yourself” – that’s hysterical coming from someone who I just proved is clueless to the point of suspected brain damage. As detailed in the posts above which you of course ignored. “the stated purpose is to protect citizens” – thank you for finally grasping this fact. Although this is not relevant to the discussion at hand. The rest is of course musing from a pro-Palestinian ultra-left journalist from one of the biggest pro-Palestinian propaganda sites. (trying again, part 1): “I anticipated you would not understand any of this” – oh I understood it allright. As I explained in detail in the 2 posts above you just ignored, along with the evidence I provided which you just ignored. No Ido, it is my duty to convince reasonable people with whom one can have productive and honest and not interminable conversations. There is a difference. We know you. Aside from your inveterate fact/interpretation confusion, from this we get a further sense of your limited education. Now we have the fact/narrative confusion and the attempt to pass off written histories as something like the periodic table of elements or layers of geologic strata we can all agree on. As if it were epistemologically equivalent to say “The Burgess Shale has been dated by verified radiocarbon methods to 508 million years old in the Middle Cambrian” and “The Zionist narrative of the Middle East is what Ido Geller says it is and he has covered every exhaustive fact with 100% objectivity.” A cause for mirth. The rest of what you say is like flotsam orbiting that wayward planet. This is spoken like someone who thinks, or pretends he thinks, that because a carburetor and the fuel lines are a tiny percentage by weight of a car, that the car runs fine without them. “it is my duty to convince reasonable people with whom one can have productive and honest” – first, it’s very honest of you to post without waiting for this technical marvel of a site to finally post my response. Again: this is what you posted: “I don’t feel it is my duty to convince you. I only need to explain things truthfully”. You made some hilarious unsubstantial lying nonsense claims and when I call you on it, explaining how you are wrong, provide evidence which contradicts you, you pathetically come up with these hilarious excuse not to back up your nonsense. And you don’t realize how not being able to do so is an answer all by itself. “We know you” – Right. I posted in 2 parts a detailed explanation of your clueless nonsense which is literally some of the most hilarious anti-Israel lies I have ever seen. Why is it so difficult for you to address this ? “fact/interpretation confusion” – Again: point to which fact I stated and prove me wrong. Go ahead. Why is this so difficult for you ? Again: historic fact is not an interpretation. Why are you lying about this ? the evidence is right there. “the fact/narrative confusion” – the only confusion here is you with accepting reality. “written histories” – which part of actual historic evidence you can literally bang your head against is too difficult for you to grasp ? and of course written history backed by multiple historic evidence is something anyone with a brain will agree on. “The Zionist narrative of the Middle East” – you dismissed the existence and history of the Jewish nation among other ridiculous nonsense. You’re a joke. “what Ido Geller says” – seriously ? not me, actual history and evidence. I posted it for you to educate yourself. This is some impressive denial you got there. “the car runs fine without them.” – aaand again you ignored what I posted and went for a different “analogy” which is unrelated to what you posted or what I said. yes those 5% is the heart of the West Bank, never mind that it will be traded in a land swap. Can you be more pathetic ? The day you stop throwing ad hominem is the day you actually win an argument because then you won’t feel the insecure need to throw it. Hasn’t happened yet. “you actually win an argument” – you mean other than proving in detail how you’re a clueless liar who believes some of the most ridiculous anti-Israel nonsense I have ever seen ? who refuses to back his arguments repeatedly and make hilarious excuses not to do so ? who refuses to address my posts ? who ignore the evidence I provide repeatedly ? “won’t feel the insecure need to throw it” – oh yes, it’s all about my insecurities, not pointing out in detail how you’re a clueless liar. For the 5,764 time: Every time I called you an idiot I backed it up, showing exactly why that is. Would you prefer perhaps ‘reality challenged’ ? “Hasn’t happened yet” – right, the posts which you ignored above don’t exist, the evidence which you ignored above don’t exist. Me pointing in detail how you have no idea what you’re talking about, refuting your ridiculous nonsense in detail doesn’t exist. Keep lying to yourself, I don’t mind. Doesn’t mean I won’t point out in detail how you’re a clueless ‘Useful Idiot’ liar who has no idea what he’s talking about. Ido’s comical theory of “backed up” ad hominem. Could anything better showcase how he just doesn’t get it? “Ido’s comical theory of “backed up” ad hominem” – why are you lying about this when evidence is all over the posts above ? how pathetic. “anything better showcase how he just doesn’t get it” – anything better than you ignoring my posts and evidence and make some of the most hilarious excuses in the process to not address them to show how you’re a joke ? (part 2, take #5): “I can picture a smug Roman Ido” – your ridiculous nonsense is only exceeded by your inability to grasp simple concepts. And your excessive lying. The guard post is a clear violation of the Oslo Accords. Ido just doesn’t get it. I can’t help that. I’ve tried my best. I reckon we gotta move on. We’re still chuckling over “backed up ad hominems” but, as always, this threatens to become the Ben and Ido Show and that is the last thing I want. These are serious issues and people are suffering. I think we all should pay attention to what Betz Uber writes about Palestinian history, Palestinian nationalism and the Palestinian People, and the false Israeli right wing assumptions about it all that have become standardized hasbara. I would draw everyone’s attention to that, up there in the facebook section. Betz Uber handles it well. Ido will drum away on the “Dhimmi” tune (so JPost, so stereotype-clinging, so-selective-past-clinging) but the basic truth remains. It upsets Ido’s entire apple cart, runs contrary to his undying message. By the way, Ben Gurion certainly believed the Palestinians had a country. (part 1): “The guard post is a clear violation of the Oslo Accords” – you want to discuss violations of the Oslo accords ? safe to assume you have no clue about what the Palestinians have been doing. Is allowing Palestinians to slaughter children on their way to school on a road permitted to Israelis signed by the Palestinian Authority is in one of the paragraphs I missed ? care to direct me to the relevant one ? “We’re still chuckling over “backed up ad hominems”” – the royal “we” ? I simply repeat how when I say you’re an idiot I always back it up with proof, you just ignore it, as always. “we all should pay attention to what Betz Uber writes about Palestinian history” – And I refuted her biased anti-Israel nonsense in detail above backed by evidence. Please by all means, address it if you want. I’ll be happy to discuss this with you. “I would draw everyone’s attention to that”- oh most certainly. Please anyone read it in the Facebook comments section. Where I refuted some of the most common pro-Palestinian propaganda lies and ignorant mistakes. “Betz Uber handles it well.” – oh yes. Very well. It’s both amazing and hilarious that you’re in denial about this as well. “Ido in response tones down” – Ido’s responses refuted her posts, in great detail, backed by lots of evidence. “but Betz Uber’s point is not overturned” – yes, keep saying this to yourself. Who needs this pesky reality when you can substitute it with your own delusional nonsense ? “LoL.” – yes, this technological marvel of a site is truly something else. But it gives you another opportunity to ignore my posts showing in detail how you’re a clueless liar so you got this going for you. Which is nice. (part 2): “Ido will drum away on the Dhimmi” – Ido proved she was wrong by providing lots of historic evidence refuting her claim, which is a very popular claim among the anti-Israel crowd. And the fact that the Jews in Arab lands were Dhimmis is not ‘a drum’ or a ‘tune’, it’s a historic fact. Are you having a hard time accepting this as well ? read a history book and stop embarrassing yourself. “so JPost, so stereotype-clinging” – yes, JPost invented the idea that Jews were second class dhimmis in Arab regions and paid the Jizya tax. “the basic truth remains” – you for some reason stopped after this part. Which is ? do go ahead. Please address the evidence and historic facts I posted, they are right there in the Facebook comments section. “It upsets Ido’s entire apple cart” – how can I take you seriously when you say such outrageous lies ? how does me refuting her posts in detail backed by lots of evidence is ‘upsetting my entire apple cart’ ? please do explain. This should be good. “Ben Gurion certainly believed the Palestinians had a country” – no he didn’t, he was talking about land in the original quote in Hebrew (Artz’am means their land, see also ‘Hevel Eretz’, can also translate to ‘country’). Historically there was no Palestinian country or nation and you know it. Yes the dhimmi tune is JPostish, stereotype-clinging, selective-past-clinging, dumbed down and casually demonizing, refusing to see Arab persons as capable like all humans of social and political change—because then you’d have no choice but to move forward with the de facto one state of all its people reality that you have created but won’t face the consequences of. You indulged your fanatic settlers and it felt good for a while, the nationalistic pleasure, the drunkenness, but now you’re heading for a hangover, and denial and delay is a poor strategy and the chickens came home to roost and suddenly you’re waking up to the fact that this two states you could have had is dead. And you have killed it. (Ye who like to lecture others on never missing an opportunity to miss an opportunity.) And the bed is made but you haven’t yet learned how to lie in it constructively. So you cling to past stereotypes and self-concepts and a residual supremacism and a whole lot of resentment and are digging in your heels at undergoing the necessary social and political evolution. It’s hard work. And very uncomfortable. I understand that. No one ever gave up power voluntarily. (It reminds me of the white male and some female rage against #MeToo and the Democrats’ treatment of Brett Kavanaugh. Accepting profound social change and giving up power and entitlement is really hard. Jews actually share power with mere Arabs? As genuinely equal citizens? It enrages. And after all the history, it’s a very hard task, but you created this de facto one state reality that you don’t know yet how to deal with. +972 is showing you the way.) And why not milk the Trumpian spasm and the European Right’s anti-immigrant wave reaction for all its worth in the meantime and cozy up to Polish and Hungarian anti-Semites? Why not ride that wave and draw false equivalences between Europe and Israel-Palestine? And pretend you are in solidarity with the Europeans but detest the Europeans when they let out a peep about the occupation. So convenient. So it will require outside incentives aka outside (hopefully nonviolent) force. Actions have consequences. So…apartheid or one state of all its citizens? Your choice, Sir? You can demonize and chant “it’s never going to happen, Arab hellholes, dhimmis, blah blah blah” but it is JPostish cult-speak and you identify no useful path forward. (part 1): “Yes the dhimmi tune is JPostish” – you are saying that a historic fact about non-Muslims living in Islamic countries is and I quote: “JPostish, stereotype-clinging, selective-past-clinging, dumbed down and casually demonizing”. I repeat: specific aspects, status and behavior regarding non-Muslims in Islamic countries in the past, a historic fact well documented is “JPostish, stereotype-clinging, selective-past-clinging, dumbed down and casually demonizing”. This is a fantastic example of you having a very hard time coming to terms with factual evidence which negates your delusional brainwashed take on reality. Thank you for providing it. “refusing to see Arab persons as capable like all humans of social and political change” – and here we have a fantastic example of you lying about what I said, claiming I said something which I never did. What I did is simply point to historic facts, which included the treatment of non-Muslims in Muslims countries in the past. I specifically mentioned the time of each example, and you say “I refuse to see Arabs capable of social and political change”. Not only does this has nothing to do with what I said, it’s you lying and twisting what I said to try and fit the examples I provided into some kind of way that would make sense to you. This is fascinating. “move forward with the de facto one state of all its people” – and here we have an example of you taking something you lied about and attempting to fit it into a different issue, the refusal of Israel to commit national suicide by turning itself into an Arab country. Now I’m sure you are aware how the Dhimmi status of non-Muslims is non-existent today, I believe it only exists in Daesh controlled territory. But you have to rationalize this somehow to fit your delusional lying nonsense so here we are. “reality that you have created” – and this is one of my favorite parts: Historic fact is apparently ‘reality I created’. Another great example for you inability to cope with reality. (part 2): “You indulged your fanatic settlers” – and here we get to some more lying. Not only did I never did, I actually said the opposite about West Bank settlements and how I support their dismantlement. “the nationalistic pleasure, the drunkenness” – at this point I’m assuming you’re drunk typing, a sort of mini-projection. “waking up to the fact that this two states you could have had is dead” – no idea where you pulled this from, could be the drunken haze. “you have killed it” – right, I killed the two-state solution. This is becoming more sad than funny. “So you cling to past stereotypes” – still in denial that I refuted a claim about something which existed in the past, I literally wrote which date. “digging in your heels at undergoing the necessary social and political evolution” – again, I’m assuming this nonsense means something to you but I should probably be as inebriated as you to make sense of it. “very uncomfortable” – an adequate description of how you perceive reality, which explains the delusions and lies. “No one ever gave up power voluntarily” – no one voluntarily chooses to live in a failed state. “Jews actually share power with mere Arabs?” – you seem to be puzzled by my refusal to turn my country into a glorious human rights haven, prosperous democracy and freedom filled booming economy and a religious tolerant paradise, a paragon of equality and stability like Syria, Iraq, Lebanon, Jordan and Egypt. Especially for a Jew. Ask Israeli Arabs who live in Israel, not on record, if they want to live in one of them. You’ll get the exact same answer. Hell no. “de facto one state reality” – as always I can’t stress enough how much this is not going to happen. This is actually a rare consensus among all of Israel’s political spectrum. Well, besides the Arab party since some of them support Israel’s demise. “+972 is showing you the way” – I always adore your little jokes. (part 3): “Trumpian spasm and the European Right’s anti-immigrant” – why can’t Israel end itself by turning into an Arab country ? how intolerant of them. “cozy up to Polish and Hungarian anti-Semites?” – right, I did that. “ride that wave and draw false equivalences between Europe and Israel-Palestine” – what the hell are you talking about ? the situation in the Israel-Palestinian conflict is nothing like it. “And pretend you are in solidarity with the Europeans” – OK now you are in projection overload mode. Amusing but kinda sad. “So convenient” – so unrelated. “So it will require outside incentives aka outside (hopefully nonviolent) force” – well the Arab nations tried to turn Israel into an Arab state by force several times, sadly all too violent. Didn’t work out so well for them. “Actions have consequences” – of course. Like the Palestinian leadership refusal to accept Israel’s continual existence and their rejections of any attempt to reach a peace agreement that doesn’t include Israel’s demise. “apartheid or one state of all its citizens?” – none of the above, as I said to you many times. Two states solution and not according to the Palestinian vision (which is one Jew-free Palestinian state, another Palestinian Arab state where Jew can live in). “Your choice, Sir?” – I answered this question for you at least 5 or 6 times. “can demonize and chant “it’s never going to happen” – apparently refusing to see the demise of my country is ‘demonizing’. “Arab hellholes” – so you’re unfamiliar with what’s going on all around Israel ? what a shocking surprise. “dhimmis” – factual historic fact which you lied about in some amusing fashion. “JPostish cult-speak” – apparently historic fact and reality is ‘JPostish cult-speak’. Who knew. “you identify no useful path forward” – I actually said the exact opposite quite a few times including here. Two state solution which doesn’t include Israel’s demise. When I saw your immediately bogus conversion of your singing of the dhimmi propaganda tune in the present into my denying “historic facts in the past”—which actually totally and perfectly misses my main point—how do you do this?—it’s amazing—and then dissolved into total incoherence further down with “I’m sure you are aware how the Dhimmi status of non-Muslims is non-existent today”—which only reinforces my main point while you somehow, very oddly, think it reinforces your point—when I saw all that I stopped reading. “immediately bogus conversion of your singing of the dhimmi propaganda” – Again: how on earth is a historic fact from the past, backed by irrefutable evidence, is ‘dhimmi propaganda’ ? how can you say something this stupid, about a historic fact which I explained in detail backed with lots of evidence and be taken seriously ? what bogus conversion ? explaining how you made a completely wrong accusation not based in actual reality ? all explained in detail in the posts you just ignored ? “tune in the present” – Again: I don’t recall how many time but I believe quite a lot: Israel will not allow itself to commit national suicide by become an Arab state. If you find this puzzling, even after I explained this in detail in the posts you just ignored, you have my sympathies. “misses my main point” – I didn’t miss your point, I pointed in great detail how you were talking nonsense, mixing my post refuting a popular anti-Israel propaganda claim in the Facebook comments section, which dealt with Jews in Arab/Islamic countries in the past, with the present regarding a no longer existing legal status of non-Muslims in Muslim states. I explained this in great detail, how on earth are you still clinging to this idiotic lie ? “which only reinforces my main point” no it doesn’t, liar, it proves the exact opposite. How can I take you seriously with your hilarious mental gymnastics and clueless mistakes ? “think it reinforces your point” – it doesn’t. I explained this in detail, it has absolutely nothing to do with the present. I was very specific, why on earth are you lying about this ? “I saw all that I stopped reading.” – of course you did. It had nothing to do with me explaining your current embarrassing false assertion and clueless mistakes. “Going on in the present about a fact from the past” – I wasn’t, that’s what I’ve been saying very clearly but you seem to be too stupid to understand. “applied meaningfully in the present” – Again: not what I said. Why are you lying about this when the posts are right there ? I have no intention of living in an Arab country today, do you understand ? nothing to do with a non-Muslim status centuries ago, do you understand ? “is a form of prejudicing people in the present.” – Apparently reality is a prejudice. Who wouldn’t want to live in a glorious human rights supporting haven, prosperous democracies filled with freedom with powerful economy, a religious tolerant non-tribal society, paragons of equality and stability like Syria, Iraq, Lebanon, Jordan and Egypt. Especially for a Jew. Why on earth will I, or any other individual who is familiar with reality, would want to turn a country like Israel into something like this ? like I said: never going to happen. No matter how much Arab countries or the Palestinians want it, Israel is not suicidal. This that you write is all about the past not the present or the future. Except if we want to ask about the apartheid present why would Palestinians want to live in that reality? Aka hellhole? Wasn’t South Africa enough precedent? (part 1): “Whenever you feel the inner need to call me “stupid” I know you know you have scant argument” – hilarious.. every single time I call you ‘stupid, just like the posts above, I give a detailed explanation why that is. Which you of course ignore, just like you did now. “we can draw conclusions” – the only conclusion is that you made a very wrong assertion as I explained in great detail above, which you of course ignored. “I get to spew ad hominem if I ‘back it up’” – do you seriously want me to bring up the many examples where you call me idiotic names and such ? are you sure ? “I’m special. I’m Israeli.” – really ? this is pathetic even by your standards. How does this has anything to do with me pointing in detail over and over again how you were wrong ? how you were clueless ? how you ignore the posts where I explain this in detail repeatedly ? “And you can’t embarrass me” – I don’t have to, your clueless ignorant lying nonsense, as detailed above, does a great job all by itself. “I’m Israeli.” – and this somehow overrides the clueless nonsense you posted ? well then I have some bad news for you. “Except if we want to ask about the apartheid” – hilarious, what I said had nothing to do with this. Nothing at all. Pointed out how you for some reason made a mistake about me refuting a well known anti-Israel lie (“Jews and Arabs/Muslims had no enmity before Zionism”) and for some reason thought a status used centuries ago (“Dhimmi”) has anything to do with what I was talking to you or to the present. I explained this like to a small child, over and over again. Apparently you seem to get it so you change the subject. One of your favorite “strategies” when I catch you with your pants down. (part 2): “why would Palestinians want to live in that reality?” – I’m asking the exact same question. Why would the Palestinian leadership refuse to accept the legitimacy of Israel, the homeland of the Jewish people and reject any and all peace agreements attempts, apparently banking instead on hoping Israel will somehow march to its end ? Why would Palestinians elect a Jihadist terrorist organization who openly calls for the elimination of Israel and the murder of Jews ? why can’t the antis-emite Holocaust denier who is the current top dictator of the Palestinian Authority, an organization which funds the ‘jew murder incentive’ fund, can’t even make peace among his own people ? Never mind that I proved to you many times how Israel is not Apartheid, you of course just ignored it as usual. Also Israel,the homeland of the Jewish people, a nation you so hilariously lie and claim doesn’t exactly exist, will never ever commit national suicide and allow itself to become a de-facto Arab state, similar to the rest of the Arab states around it as I explained in great detail in the posts you of course ignored. Thanks for your contribution. Most of it doesn’t make sense or cohere so I can’t exactly say I disagree with it (any more than if you write something in medieval Korean I could disagree with it) but the parts that make some small sense I disagree with. And I agree with Jan (below). I hope that helps. “Most of it doesn’t make sense or coherent” – of course, sure. Especially when I explained it repeatedly like to an infant. “but the parts that make some small sense I disagree with” – that’s a very powerful argument, a very elegant way to address my posts which explained how you are a clueless brainwashed joke. Almost as worse as you ignoring my posts repeatedly. Almost. “I agree with Jan (below)” – why address the posts above showing in detail how you have no idea what you’re talking about when you can deflect or change the subject ? Jan makes an interesting observation which is relevant if he visited the future. I actually agree with some of what he said. I’m so glad you agree with Jan.
I’m so amused you use his post to dodge addressing the posts above where I show in detail how you’re a clueless liar who has no idea what he’s talking about. Of course I said I agree with some of what he said, not all but since when does the truth matters to you, right ? No it matters a lot. That’s why I agree with Jan. Ad hom is like scratching an itch for you. Mental fleas. That’s a very powerful argument, a very elegant way. You mean that’s why you’re trying very hard to ignore my posts above showing in great detail how you’re a clueless liar who doesn’t know what he’s talking about ? “Ad hom is like scratching an itch for you” – you must have missed it but as I said before 27 times, every time I say you’re clueless or stupid I provide a detailed explanation why that it. You of course ignore it because apparently reality is uncomfortable for you. Just like your idiotic nonsense regarding the “dhimmi” bit. “That’s a very powerful argument, a very elegant way” – Thank you. Never mind that wasn’t an argument. And most definitely not as elegant as you right now avoiding addressing my posts above where I show in detail how you have no idea what you’re talking about and how you made an embarrassingly wrong assertion based on possibly the voices in you head since it was never based on something I posted. As I explained 15 times. “Ad hom is like scratching an itch for you” – you must have missed it but as I said before 27 times, every time I say you’re clueless or stupid or have no idea what you’re talking about, I provide a detailed explanation why that it. You of course ignore it because apparently reality is uncomfortable for you. Just like your idiotic nonsense regarding the “dhimmi” bit. Also if you’re changing the subject (of course), you mentioned you’re an Israeli so I’m assuming you know Hebrew. You posted a Ben Gurion quote as evidence that a Palestinian country existed, remember ? never mind that it’s total nonsense and you know it but you remember right ? (“see! Ben Gurion says a Palestinian country existed! aha!”), I assumed you again showed how you don’t know what you’re talking about, how the English translation changed the Hebrew word which also means ‘land’ to ‘country’ and I pointed this out. But if you’re Israeli you knew what it actually meant, so you weren’t just your usual clueless, you were purposefully lying. Who said you don’t have layers ? Eretz can mean land or country, depending on context, and in this case it is mostly a distinction without a difference. In this context I think “country” is a reasonable translation. The people who translated it as such were not idiots. And the context is very simple: a Palestinian country/nation didn’t exist. Lie about this as much as you like, this fact is not going to change. “I think country is a reasonable translation” – not it isn’t simply because of the historic fact that a Palestinian country/nation didn’t exist. Unless you can travel back in time, this fact isn’t going to change because you really really want it to. “The people who translated it as such were not idiots” – why are you still clinging to the historical fabrication that a Palestinian country/nation existed ? you know it didn’t, why are you lying about this ? and they weren’t idiots, just very creative with their translation and simply chose to ignore the original text and its time period. You of course again ignored all the posts above detailing your other clueless nonsense and lies but hey, I would be surprised if you didn’t. Really ? well, one expresses the idea that a Palestinian country existed, which is factually incorrect, and the other refers to land, which indeed existed. So now you’re going to address the posts above showing in detail how you’re a clueless liar who has no idea what he’s talking about ? please start with your hilarious wrong blabber about the “dhimmi” bit. But what difference does it make in terms of the issues now? what does this has to do with the fact that you lied about a translation of a very old quote ? to try and justify your delusional nonsense about the existence of a Palestinian country ? relax with the squirming and dodging, you’ll break something. and are you going to continue elegantly ignoring the many posts above detailing your many clueless nonsense and other lies ? Please start with your hilarious wrong blabber about the “dhimmi” bit. That was particularly amusing. I see, so it makes absolutely no difference in terms of the issues now. Glad we cleared that up. “Glad we cleared that up.” – you’re lying about this as well ? amazing. the only thing we cleared is the fact that you knowingly lied instead of what I thought was you again showing how you have no idea what you are talking about. Again: what does this has to do with the fact that you lied about a translation of a very old quote ? to try and justify your delusional nonsense about the existence of a Palestinian country ? And it terms of ‘the issue now’ of course it makes a difference, it again shows how the Palestinian narrative is built on a fabrication of history. It also show how you’re a liar. And are you going to continue elegantly ignoring the many posts above detailing your many clueless nonsense and other lies ? You’re just jabbering. I lied about nothing. Ben Gurion said it and the translation is a fair one and the hay you are trying to make out of an extended exercise in irrelevance, a snow job, on “land” versus “country,” would not melt two snowflakes if I set it on fire. It’s a dud. A wet firecracker. “I lied about nothing” – You brought a quote of Ben Gurion talking about a Palestinian country ? yes or no ? you used it as a justification that a Palestinian country existed, yes or no ? (“see! even Ben Gurion admits a Palestinian country existed! aha!”). As I pointed out, the translation of the original quote means ‘land’, not country. As a Palestinian country didn’t exist. I thought you were just being your clueless self again. Then you said you are an Israeli so it adds another layer to your lies, you knew the word also means ‘land’. You were trying pathetically to justify something which didn’t exist by using a mistranslated Hebrew word. So you didn’t lie you say ? just again showing how you have no idea what you’re talking about ? I’m fine with this as well. “the translation is a fair one” – no it isn’t because a Palestinian country didn’t exist then. How hard is this to grasp ? are you that clueless about history ? a Palestinian nation/country didn’t exist no matter how hard you want it to be true. “make out of an extended exercise in irrelevance, a snow job” – said the clueless liar, as evident in the many posts above. Posts you elegantly ignore repeatedly, even now. “on “land” versus “country,”” – I’ll just copy/paste it again: one expresses the idea that a Palestinian country existed, which is factually incorrect, and the other refers to land, which indeed existed. “It’s a dud. A wet firecracker.” – you’re a clueless liar who has a very hard time dealing with reality, a ‘Useful idiot’ brainwashed with some of the most ridiculous anti-Israel propaganda I’ve ever seen (for example: to you the Jewish nationality doesn’t exactly exist and you made some very hard effort to ignore the huge amount of evidence I provided showing your you’re being ridiculous). The translators were not idiots. It is first insisted it means A not B, then it is said it “also” means A. Inferring that the other thing it means is B. Otherwise the “also” makes no sense. But, Geller, aside from this embarrassment, consider that we could take the same English-translated passage of Ben Gurion and substitute either “Eretz” or “land” for “country” and it doesn’t help your pro-occupation case. Eretz means land or country, depending on context, or land *and* country. In the case of this context, both are reasonably implied. Let’s go wild and grant even more for argument’s sake. “A non-sequitur takes place.” – Really ? digging yourself deeper into the stupid hole ? A Palestinian country and/or nation didn’t exist. Do you you understand ? this is not a philosophical question or a matter of opinion. This a historic fact. Is this somehow difficult to understand ? “It is first insisted it means A not B, then it is said it “also” means A” – your squirming and jumping through hoops and making such a valiant effort to justify your idiocy is charming in a pathetic sort of way. “Q.E.D.” – yes, writing Q.E.D somehow made the claim that a Palestinian country existed become reality. Very impressive. “aside from this embarrassment” – couldn’t have said it better myself, you most definitely embarrassed yourself again, not by just lying and twisting a quote to justify your alternate reality take of historic events, you add pathetic attempts to try and justify your hilarious mistake. “and substitute either “Eretz” or “land” for “country” ” – Again: lying and jumping all around this issue won’t change the fact that a Palestinian country didn’t exist, this was your point, this is what you were trying to claim, you said it yourself. Why are you digging yourself deeper into the stupid hole ? “help your pro-occupation case” – this has nothing to do with occupation or anything else. This is a very, very simple concept: a Palestinian country/nation didn’t exist. You brought a distorted quote to justify something which didn’t exist. I explained how the quote actually meant something else which actually matched reality. That’s it. Your pathetic lying and squirming all around this issue is amusing but quite futile. It won’t somehow make a Palestinian country exist for Ben Gurion to comment on. “or land *and* country. In the case of this context, both are reasonably implied” – nope, Again, 345th time: A Palestinian country didn’t exist. How hard is this to grasp ? “Let’s go wild and grant even more for argument’s sake” – that’s actually the correct translation, it meant land not country as a Palestinian country didn’t exist. “What’s the difference?” – Again: one expresses the idea that a Palestinian country existed, your entire point as I quoted you, the reason you brought the quote, which is factually incorrect. The other refers to land, which indeed existed. How the hell is this so difficult to grasp ? And why are you again ignoring all the posts above detailing your clueless nonsense and lies ? you think ignoring them will somehow make them go away ? Palestine nation/people issue is over, has been since 1993, but seems that news comes very late to some. 118. As regards the principle of the right of peoples to self-determination, the Court observes that the existence of a “Palestinian people” is no longer in issue. Such existence has moreover been recognized by Israel in the exchange of letteirs of 9 September 1993 between Mr. Yasser Arafat, President of the Palestine Liberation Organization (PLO) and Mr. Yitzhak Rabin, lsraeli Prime Minister. In that correspondence, the President of the PL0 recognized “the right of the State of Israel to exist in peace and security” and made various other commitments. In reply, the Israeli Prime Minister informed him that, in the light of those commitments, “the Governnlent of Israel has decided to recognize the PL0 as the representative of the Palestinian people”. The Israeli-Palestinian Interim Agreement on the West Bank and the Gaza Strip of 28 September 1995 also refers a number of times to the Palestinian people and its “legitimate rights” (Preamble, paras. 4, 7, 8; Article II, para. 2; Article III, paras. 1 and 3; Article XXII, para. 2). The Court considers that those rights include the right to self-determination, as the General Assembly has moreover recognized on a number of occasions (see, for example, resolution 9;8/163 of 22 December 2003). It is first insisted it means A not B, then it is said it “also” means A. Inferring that the other thing it means is B. Otherwise the “also” makes no sense. And so why was “also” employed? Hence, a non sequitur arises, and the illogicality is shown, and the suspicion confirmed that the insister of A not B knows he that he has been talking through his hat all along and making simplistic black and white mountains out of complex ambiguous molehills and been found out. Q.E.D. Pointing out a historic fact, which you tried to disprove by providing a translation inaccuracy, is “just jabbering” ? quoting you literally trying to justify a lie based on a bad translation is “Filling empty space” ? “nay your passion” – your passion seems to be having a hard time dealing with reality when it contradicts with your brainwashed anti-Israel lying nonsense. As evident in the many posts above, posts you again refuse to address. “clueless liar” – Again: every single time I call you a clueless liar I back it up with the reason why that is. Feel free to refute it. Go right ahead. “yelling that he ignores me” – I provide evidence, you simple chose to not address it. I explain in detail why you’re a clueless brainwashed liar, you skip it. How would you like me to call it other than ‘ignoring’ ? ‘selective un-reading’ ? for example the posts above explaining your wrong assumption about the “dhimmi” bit, which I explained like to a child multiple times, why are you yet gain refusing to address it ? So you made a stupid mistake, probably another one of your cognitive dissonance short-circuit thing, when you realize I’m right but can’t face the reality of it, why do you keep ignoring this ? sorry, ‘selective un-reading’ ? “must point out the internal flaw in order to invalidate it” – you mean besides repeating for 9 times how a Palestinian country/nation didn’t exist ? how claiming it did, like you did, is factually incorrect ? “It is first insisted it means A not B, then it is said it “also” means A. Inferring that” – your pathetic attempt at a “creative” logic deduction when the historic fact is shoved in your face repeatedly astounds me. “and the illogicality is shown, and the suspicion confirmed” – this is very, very simple: you provided a quote to justify the existence of a Palestinian country, yes or no ? your quote is right there above. You used the translation of the word ‘land’ as ‘country’ as the reason for your justification, yes or no ? you apparently were aware the word also means land, yes or no ? you ignored the historic fact that a Palestinian country (or nation) never existed, invalidating the use of the word ‘country’ by the meaning you specifically used to justify your nonsense. Yelling ‘ Q.E.D’ will now somehow change any of this. It’s amusing though. why are you still clinging to this idiotic lie ? and why are you still ignoring all the posts above detailing your clueless lying nonsense ? C’est encore plus japper. Ma petite preuve est sans faille. Les molehills ne sont pas des montagnes. Right, your proof is flawless because you typed a post in french. So I caught you lying again, what’s the big deal ? how many times have I did this so far ? I lost count. Again: 16th time: you tried to justify something which didn’t exist with a bad translation from Hebrew. I thought you are just your clueless self but apparently you understand Hebrew so you knew the word meant ‘land’ not ‘country’, especially since a Palestinian country/nation didn’t exist, no matter how much you want it to. I explained this in detail like to a demented child. But you typed in french so your lying nonsense is all good. Makes sense. why are you still clinging to this idiotic lie ? and why are you still ignoring all the many posts above detailing your other clueless lying nonsense ? Vous êtes un menteur au lavage de cerveau insignifiant, les preuves sont affichées ci-dessus. As I explained elsewhere, you show no evidence of ever being more than a mouthpiece for Netanyahu, a parrot, masquerading as something more liberal I should say but I don’t even really see that you are trying to pretend except for a few totally hollow, perfunctory lines about “supporting a Palestinian state.” All you do here is tenaciously defend Bib’s propaganda line, to the point of repetitive incoherent jabbering as long as you can work in “slaughter of Jews.” Où est le boeuf? (part 1): “As I explained elsewhere” – and as I explained in the same elsewhere, you’re talking nonsense again. “more than a mouthpiece for Netanyahu” – ah so we’re changing the subject yet again so you won’t have to deal with all the posts above showing in detail how you’re a clueless liar who has a hard time dealing with reality. I ask again, as always: point to anything I said and prove me wrong. I refuted your nonsense in detail, all written very clearly in the posts above. Never mind that as I said mant times I consider Netanyahuto be the worst Prime Minister in Israel’s history and I don’t agree with him or his government, go right ahead. “masquerading as something more liberal” – and here we are again where you lie about me, or is it “rephrasing” ? “dispatching” ? “using artistic license” ? I get confused with all your pathetic excuses not to address my posts refuting your nonsense, like I did here. “perfunctory lines about supporting a Palestinian state.” – I think I was very specific when I mentioned this for about 30 times to you. Why are you lying about this as well ? you think this will somehow divert attention from your clueless nonsense and lies all detailed and explained in the posts above ? “tenaciously defend Bib’s propaganda line” – I simply explain in detail how you’re a clueless liar who is brainwashed by some of the most ridiculous anti-Israeli propaganda available. Your pathetic attempt to avoid addressing this by lying about me supporting Netanyahu, when you know I don’t, when this has nothing to do with what I posted above, is extremely pathetic. (part 2): “incoherent jabbering” – calling my detailed explanation of your clueless nonsense and lies above ‘incoherent nonsense’ will not somehow make it all go away, doesn’t matter how much you want it to. Please feel free to address the posts instead of squirming around them with your pathetic excuses. “as long as you can work in “slaughter of Jews.”” – what’s amazing about this is how you still seems to be in denial about the Palestinian leadership funding, calling for and providing incentive for Jew murder even after I provided you with so much evidence including videos of the Palestinian leadership themselves, in the flesh, yelling it in your clueless face. Your pathetic excuses not to address said evidence was comedy gold (“it’s fake”, “the leadership is not that important or influential”, you ‘divert'”). Are you going to address this or are you again going to ignore this as always ? and why are you still ignoring all the many posts above detailing your other clueless lying nonsense ? “Où est le boeuf?” – oh yes, posting nonsense in french will somehow make all the posts above, detailing your clueless lying nonsense disappear. Anytime now. Did you ever notice that you produce unreadable verbose, three part, tedious line-item diatribes like no one else? Have you ever asked yourself why that is? It’s never occurred to you it’s because 90% if these things are dross? Compiled mostly of stock phrases (“I already showed in detail… shoved in your face… evidence… links….proof… I guess you didn’t know…you’re changing the subject…you have no idea what you’re talking about…why are you lying about me?, Jew murder…murder of Jews…Jew blood…”). And added silly ad hominems (“clueless liar… stupid.., idiot…liar”), and patronizing (“I guess you didn’t know that…”). And mindless propaganda (“river to sea, dhimmis…destruction of Israel…,Arab hellhole…national suicide, blah blah blah”) withcondescension and racism coarsing through almost every line. And faulty reasoning (see: Fuji vs. Gala apples) and ‘Fawlty Towers’ pontificating? The whole obnoxious stew served up after day with the logic that mere blithering repetition is an accusation and a proof of righteousness (“why are you ignoring me?”). Dross. Never occurred to you? “Did you ever notice” – did you ever notice how you repeatedly elegantly ignore my posts ? where I show in detail how you’re a delusional clueless liar who has no idea what he’s talking about ? “because 90% if these things are dross” – please, by all means, address it. Prove me wrong like I refute your clueless nonsense. Why is this so difficult for you ? go right ahead. “Compiled mostly of stock phrases” – what a coincidence, you still refuse to accept reality, still lie and make clueless claims, still have a hard time dealing with the fact that you are a brainwashed ‘Useful Idiot’ who still cling to some of the most deranged anti-Israel propaganda as fact and claims about the Palestinians with no relation to reality even after I provide you evidence after evidence that you’re wrong. Would yo like me to “rephrase” ? instead of ‘denial of reality’ I’ll call you ‘reality challenged’. Instead of clueless I’ll use ‘selective ignorance’. “Jew murder…murder of Jews…Jew blood” – right, the fact that you are still hilariously in denial about the Palestinians actions and agenda in this regard, even though I shove the evidence repeatedly in your face, has nothing to do with it, right ? the truth about the Palestinians can be uncomfortable, deal with it. “silly ad hominems” – Again: like always, every single time I back it up, explain why that is. You always seem to ignore this part for some reason, I wonder why that is. “And mindless propaganda” – liar. Everything I said is backed by evidence, by facts, which you simply choose to ignore or distort as I explained in detail in the posts above, many times. Why are you lying about this again ? and it’s hilarious how you mention ‘propaganda’ when I list some of the more colorful anti-Israel and anti-semitic propaganda you for some reason believe in. “faulty reasoning” – Explained your idiotic analogy and how it has nothing to do with the actual topic in detail about 8 or 9 times, how is this still hard for you to grasp ? amazing. “Dross. Never occurred to you?” – it occurred to me that you again elegantly ignored the many posts above which detail your clueless nonsense, your lies and distortions of what I said, your inability to accept reality because it contradicts your delusional fantasy view of the world even when the people you’re defending are yelling the truth in your face, literally. Thanks for the dross. Just to give you feedback, this is an unreadable, verbose, tedious line-item diatribe. This one is about 85% stock phrases, 15% name calling and 95% faulty reasoning. And Fawlty. It sounds best imagining John Cleese yelling it aloud. To be fair, I agree with you that you are “yelling.” I’ll grant you that. Why are you again talking nonsense while ignoring the many posts above showing in great detail how you’re a clueless ‘Useful Idiot’ who doesn’t know what he’s talking about ? I only repeated everything 15 times so I understand why grasping this is difficult for you. Why are you lying to yourself like this ? is this some kind of coping mechanism ? like the 7 stages of grief ? First ignore, then lie, then attempt to discredit, then reject by making hilarious nonsense so you won’t have do deal with reality ? This is fascinating on an anthropological level, how a ‘Useful Idiot’ clueless liar rejects reality even when it is shoved in his clueless face repeatedly. Why is is so difficult for you to come to terms with the fact that you have no idea what you’re talking bout ? that you live in a fantasy land from an alternate reality where Hamas and the PA match your lying nonsense ? where their goals and actions match your nonsense and not reality ? Why are you in denial about this when I bring you evidence of the top Palestinian leaders yelling this in your clueless face ? you tried to lie about PLO changing their charter, I proved you wrong, you just ignored it. Why is that ? you think if you ignore it it’ll go away ? are you a child ? And why again are you ignoring all the posts above where I show in detail how you’re a clueless liar who doesn’t know what he’s talking about ? One suspects that you draw on this stock word “clueless” so repetitively (five times in this post alone, sixty times on this page!) because you deeply wish the mass of Israelis and the outside world especially would remain clueless. And +972 Magazine’s effective antidote to cluelessness really bothers you. Aaaand again you completely ignored the posts above showing in detail how you’re a clueless liar who has no idea what he’s talking about. And again you ignored the evidence I provided, contradicting your clueless nonsense. Why is that ? you think I won’t notice ? I don’t get it, the posts are right there. All the detailed proof that you have no idea what you’re talking about, that you’re a clueless ‘Useful Idiot’. All of it. Why are you ignoring it again ? “And +972 Magazine’s effective antidote to cluelessness really bothers you” – as always I really appreciate it when you finish a post with a funny joke. Oh by all means, show me the “antidote” to me pointing out in detail your clueless embarrassing mistakes and hilarious ignorance about Israel and the Palestinians, maybe this will actually make you address the posts above when I show how big of a joke you are. Stock phrase content: 100%! There is not a single sentence that does not contain one or more stock phrases! Stock phrase count: At least fourteen! Fourteen useless stock phrases in that single congealed package of abuse! Ad hominem count: Take the stock phrase count and multiply by 0.90. ““Clueless” count: Four more! (Sixty four! )” – aaaand again not daring address the posts above showing in detail how you’re a clueless liar who has no idea what he’s talking about. “not a single sentence that does not contain one or more stock phrases” – aaaand again ignoring the fact that every time I say you’re clueless or have no idea what you’re talking about I back it up, every single time, with exactly why that is. Minor detail you for some reason repeatedly ignore. “Stock phrase count: At least fourteen!” – oh yes, this will most definitely make all your embarrassing mistakes, lies and factually incorrect nonsense all detailed above go away. “Ad hominem count” – and apparently you don’t know what that phrase means since every single time I refuted your argument, proved how you’re a clueless liar, in detail, I backed it up. I addressed your “argument”. Explained why you’re clueless, why you have no idea what you’re talking about. And you couldn’t address it. All posted above in great detail. How can you not realize that not being able to refute my argument, squirming and flailing around it with some hilarious dodging “techniques”, is nothing short of infantile ? A meaningless stock word typically pulled out to save face when nothing else is working. “save face when nothing else is working” – nearly choked from laughing so hard. “save face” ? oh yes, after providing posts after posts detailing your lying clueless nonsense and your inability to come to terms with reality ? which you so far refused to touch ? what’s with the “switch” technique of yours ? you really think this is making you look anything other than a complete joke ? “nothing else is working” ? you mean besides me proving in detail backed by evidence you so far refused to touch, in the many posts above, how you’re a clueless liar who has no idea what he’s talking about ? posts you refuse to address because coming to terms with reality is very uncomfortable for you ? You’re a joke. A stock word ramping in frequency. Frustrated at your diminishing returns with other stock phrase assemblies? Hilarious.. again ignoring why I said you’re a joke, like you’re still ignoring all the posts above showing in detail how you’re a clueless liar who has no idea what he’s talking about. “save face when nothing else is working” – this is what you said. This is comedy gold, in reality the exact opposite happened as detailed in the posts above which you still continue to ignore. Why are you lying to yourself ? Did ignoring it made all the posts go away ? it didn’t ? maybe you should try again. I have faith in you! “comedy gold” = a repetitive stock phrase utilized when shifting momentarily from aggressive, angry harangues to faux jocularity as cover. There is a aggressive angry (“clueless stupid liar”)versus aggressive jocular (“hilarious, joke, comedy gold, fell off my chair laughing”) see-saw dynamic observable. All of it stock phrases, only alternating flavors. “a repetitive stock phrase” – aaaand again you ignore the part that explains why it’s comedy gold, just like you ignored the many posts above showing in detail how you’re a clueless liar who has no idea what he’s talking about. “shifting momentarily from aggressive, angry harangues to faux jocularity as cover” – right, right, shifting and stuff, not pointing out how what happened is actually the exact opposite of what you pathetically lie about. “There is a aggressive angry” – of course, pointing out how you’re a clueless stupid liar, backed by actual detailed posts explaining why that is, is “aggressive angry”. Your defensive mechanism to avoid dealing with reality always amuses me. “aggressive jocular ” – not as “jocular” as you saying stuff like “save face when nothing else is working” when the exact opposite took place, as detailed in the posts above. Why do you keep lying to yourself like this ? “All of it stock phrases, only alternating flavors” – Did ignoring all the posts above made it all go away ? it didn’t ? maybe you should try again. I have faith in you! What Netanyahu wants to see is a situation akin to apartheid South Africa. Just like the Black people in the bantustans, the Palestinians would have no power. It is likely that they would not be allowed to have an airport or a connection between the Palestinian state in the West Bank and Gaza. Without justice for the Palestinians, without them having a viable state not controlled by Israel, Israel should get used to being called an apartheid state. On this day in 1986 the US Congress overrode the veto of Ronald Reagan who had voted to impose sanctions on the apartheid state of South Africa. Apartheid died not long after. If the US Congress wasn’t controlled by the Israel Lobby it is very possible that they would vote to sanction Israel for their same reason that they sanctioned South Africa. The situation now in the Occupied Territories is untenable. Israel cannot forever keep millions of people under occupation with no human, civil or political rights.